I am trying out a new paper. It is Lanaquerelle 140 lb rough. I like it. A lot! 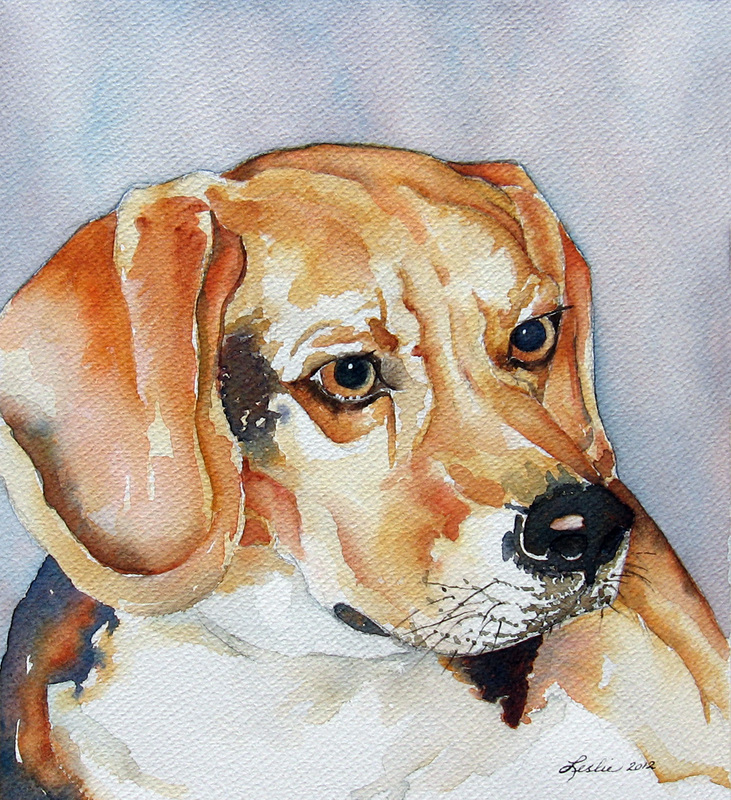 It is a little softer than Arches rough and seems to stay wet longer, allowing me to play with washes a little longer. I have also painted on this namebrand’s coldpress paper in the same weight and like it, too. I just wish it was not more expensive. How many times, my lifetime, have I heard, “You get what you pay for”. The above is from a reference photo provided by a friend. The black hues were created using harvest gold, alizarin crimson and prussian blue, in that order. The grays were made with lighter shades (watered down) of the same colors. I am playing around with using other colors to make colors I want rather than rushing to the tube color every time I paint. 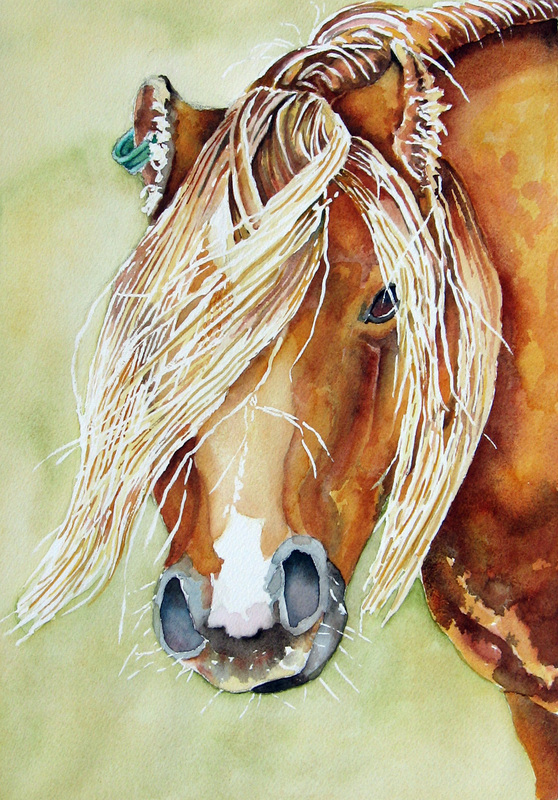 I painted the above portrait of a Welsh Mountain Pony from a photo reference by Gary Jones from the Paint My Photo site. I used liquid frisket to create the mane and the whiskers. I created the remainder of the portrait with a limited palette of harvest gold, prussian blue, burnt sienna, sepia and permanent rose. The twist of the neck, the shapes around her muzzle and the mane were challenges I wanted to try to capture with this portrait. 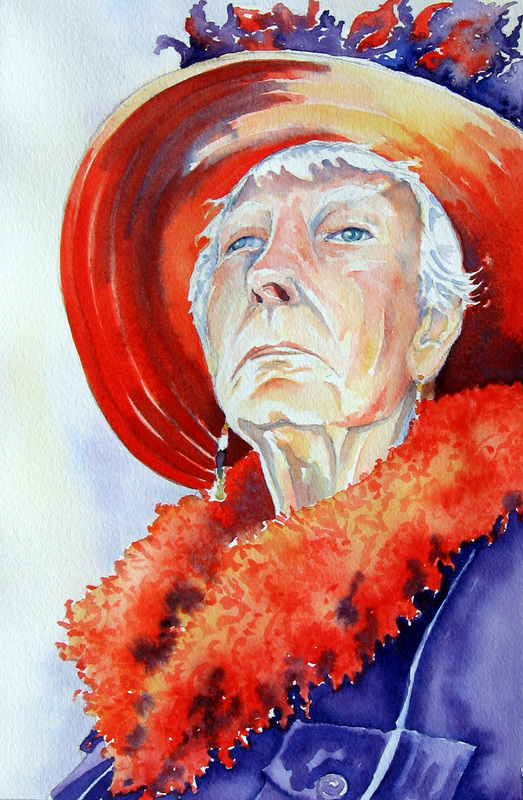 The above portrait was just plain fun to paint and try to capture the lift of the chin and the feathery neckline as well as the light. I found the reference photo for this on Paint My Photo. It was taken by photographer, Judy Wright. This week I chose one of my monochromatic paintings from last week’s post and painted it in color. The most fun was carving out the areas of light and trying to figure out the fading cliff on the left and the deep darks on the lower right. 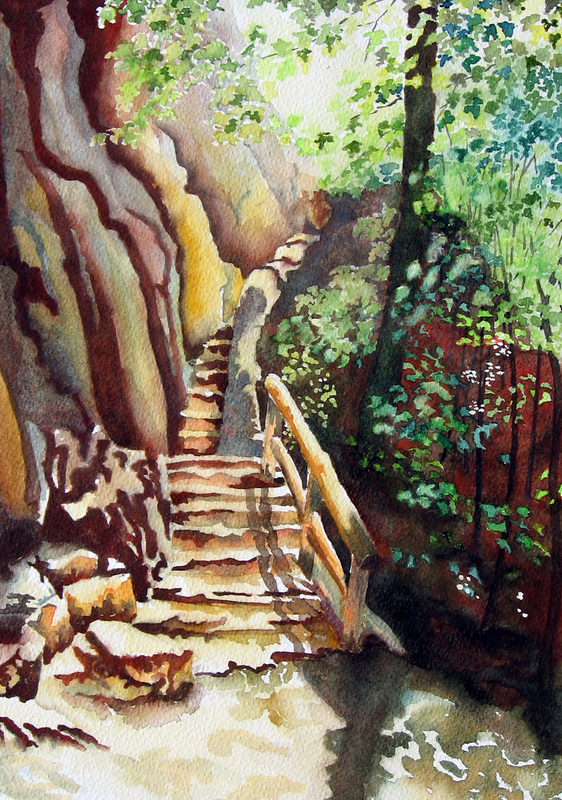 I had to change the colors of the cliffs to balance the red neutrals in that dark area on the lower right. I was pleasantly surprised that it did not change my feeling about the scene. I also included yellow to enhance the idea of bright light in areas. Thank you to Wiletta Blevins for having gifted the photo reference of this scene to me. I want to try this one on masa paper and with citra-solv collage. I have never worked the same piece over and over again, but I am not bored with this one yet. Has that ever happened to you?